Captain Jacques Rudolph is hoping for big performances from fellow South African Wayne Parnell for Glamorgan. 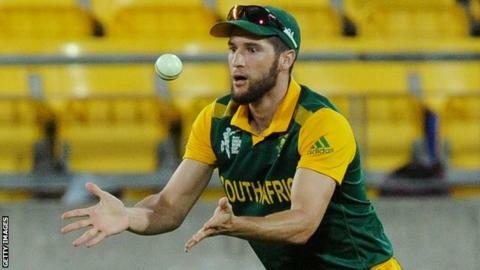 The Welsh county have signed the 25-year-old fast bowler as their second overseas player for the T20 Blast. Parnell has played four Tests, 46 one-day internationals and 33 T20 matches for South Africa. "I know that he will really contribute to our environment and hopefully he can put in some big performances," said Rudolph. The left-arm seamer's move to Glamorgan is subject to clearance from Cricket South Africa and a successful visa application. Parnell will be available for an initial spell of 10 group stage fixtures ending against Somerset at Taunton on 28 June. "For a young guy he's got a lot of international experience and he's got a bit of X-factor about his bowling," Rudolph added. "He's someone that can bowl quickly if he really wants to on his day. "As a bowling unit he will definitely contribute a lot. He'll take the pressure off some of the other bowlers and he's the perfect fit for us. "Another bonus is he's opened the batting for his own team back in South Africa in one-day cricket and he's scored hundreds there. "It's nice to have that kind of balance at the back of our batting line-up as well."